Join AWS and Think Big Analytics to learn how to apply Big Analytic solutions that benefit Financial Service industries running on the cloud. You'll gain insights into how financial service companies are leveraging cloud-based Big Analytics to reduce risk and deliver new products and services to their clients. Learn how these organizations are building technical and organizational Big Analytics capabilities. Key take-aways will include actionable tips and techniques to help you build these capabilities within your organization. Organizations struggle with how to manage the vast, ever growing mountain of data that must be protected. Using the AWS Cloud as a secure, off-site, pay-as-you-go storage location for backup data delivers a substantial return on investment, streamlines IT operations and greatly improves disaster recovery (DR) readiness. Globally-distributed enterprises are faced with organic growth of storage in each office, leading to extensive CapEx budgets, overprovisioning, and crippling duplication of capacity and data. 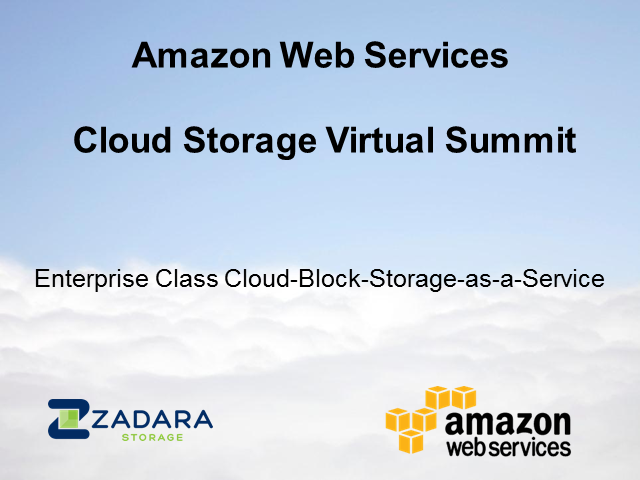 Amazon S3 cloud storage and Panzura’s cloud storage solution consolidate storage globally to a central repository while maintaining the full NAS feature set, LAN-like performance, customer-controlled encryption, and 1/3 TB of local caching.